Point Pleasant defenders Eddie Mayes (56) and Ryan Duff (75) combine on a sack of Warren quarterback Kurt Taylor during the second quarter of Friday night’s Week 3 football contest at OVB Field in Point Pleasant, W.Va.
POINT PLEASANT, W.Va. — A thorough display of Football 101. 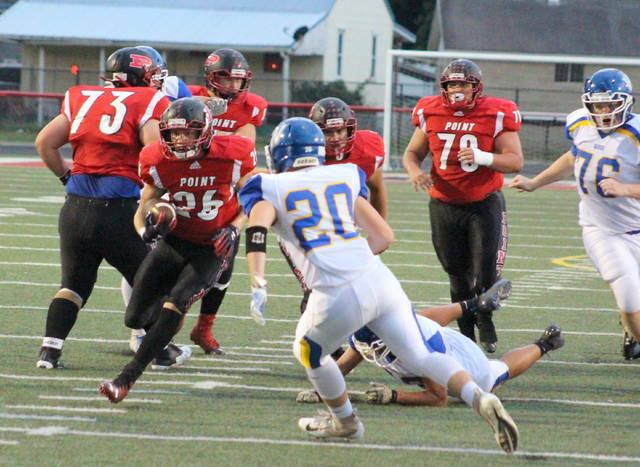 The Point Pleasant football team allowed only 52 total yards defensively, amassed 554 yards of total offense and also received three rushing touchdowns apiece from both Nick Parsons and Brady Adkins on Friday night during a 61-0 drubbing of visiting Warren in a Week 3 gridiron contest at Ohio Valley Bank Track and Field in Mason County. The host Big Blacks (3-0) — who wore red jerseys for the first time since the mid-1970s — came away with points on their first eight offensive possessions, plus added a defensive safety early in the second quarter en route to building a 54-0 halftime advantage. The Warriors (0-3) — who dropped their 23rd consecutive road decision since posting a 31-21 win at Gallia Academy in Week 8 of 2013 — didn’t fare much better in the second half as the Blue and White ended the evening with only three first downs and negative 19 yards rushing. The Red and Black, on the other hand, tacked on one final score late in the third period as Christian Holland plunged in from 10 yards out — allowing the hosts to secure a 61-0 advantage with 5:05 remaining on a running clock. 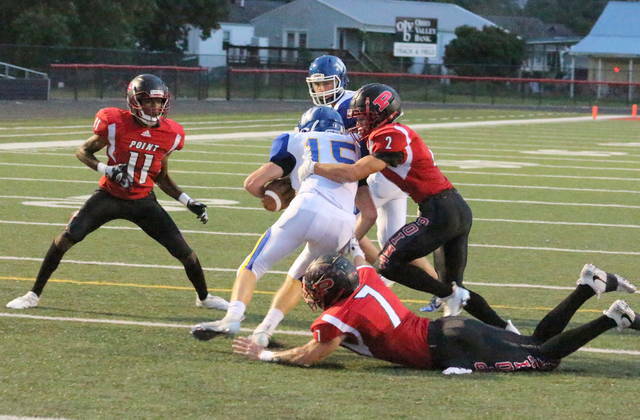 PPHS was an offensive juggernaut from the opening kickoff as the hosts poured on 28 first quarter points, which included a trio of touchdown runs by Parsons. The junior hammered his way into the end zone at the 8:52 mark of the first quarter for a quick 6-0 edge, then Adkins followed with a 14-yard scamper at the 7:41 mark. Cason Payne hit Aiden Sang with a successful two-point pass that gave the hosts a 14-0 edge. Parsons followed with an eight-yard run at the 5:49 mark for a 20-0 contest, then Parsons plunged in from five yards out with 2:21 left. Payne hit Josh Wamsley with a successful two-point pass that made it 28-0 after one period of play. Adkins delivered his second touchdown run just 13 seconds into the second frame following a 15-yard run, making it a 35-0 contest. Sixty-two seconds later, Point added another two points as Ryan Duff sacked WHS quarterback Kurt Taylor in the end zone for a 37-0 contest with 10:45 remaining. 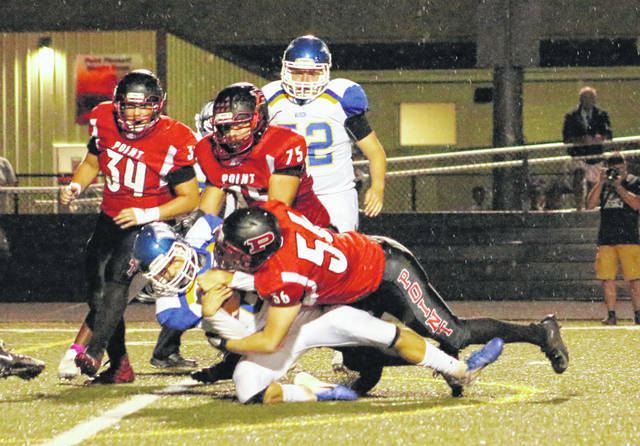 Adkins added his final rushing score of the night at the 9:19 mark as the junior rumbled 55 yards to paydirt, allowing Point Pleasant to extend its lead out to 44 points. Logan Southall got in the on the act with 7:55 remaining in the half as the junior scampered 48 yards to the end zone, making it a 51-0 contest. A lightning delay followed moments after the Southall score, but play resumed roughly 45 minutes after initial stoppage. Oliver Skeie — who was 4-of-5 on point-after attempts in the kicking game — boomed a 23-yard field goal through the uprights with 2:29 remaining until halftime, giving Point Pleasant a sizable 54-0 advantage at the break. The Big Blacks produced 475 rushing yards on 35 carries, an average of 13.6 yards per carry. The hosts also produced 19 first downs and finished the evening plus-1 in turnover differential. Following the game, 12th-year PPHS coach David Darst was somewhat overwhelmed with what he had witnessed from his troops while picking up his 101st career win. As the venerable mentor noted, it was just a really impressive display of football. The Warriors had 16 rushes for minus-19 yards and also produced 71 passing yards over the course of the night. The Big Blacks punted twice for an average of 32 yards, while the guests punted eight times for an average of 33 yards. Adkins led PPHS with eight carries for 176 yards and three scores, followed by Southall with 71 yards on five carries and Payne with 64 yards on three totes. Payne also completed 5-of-9 passes for 29 yards, while Hunter Bush was 5-of-8 passing for 50 yards. Mark Fowler led the wideouts with two catches for 30 yards and Wamsley hauled in two passes for nine yards. Duff and Jovone Johnson recorded a team-high two tackles for loss. Payne also came away with the lone takeaway on an interception at the 7:47 mark of the first period. Point Pleasant was penalized eight times for 60 yards, while the guests were flagged four times for 28 yards. Warren had four different rushers in the contest, all of whom finished with negative yardage. Taylor was 7-of-20 passing for 71 yards and an interception. Brandon Simoniette led the WHS receivers with four catches for 28 yards. After an impressive start to a three-game home stand, Point Pleasant welcomes Herbert Hoover next Friday in a Week 4 gridiron clash at 7:30 p.m.